What's New: First Aid Beauty, Algenist and LXMI | Top Beauty Blog in the Philippines covering Makeup Reviews, Swatches, Skincare and More! A non-abrasive, extra strength at-home exfoliating peel to help visibly smooth and improve skin dullness after just a single use, a lightweight, pillowy, pore-refining moisture veil with potent Nile River Valley actives to create a dewy, youthful finish and a powerful sculpting eye cream that instantly restores essential moisture to the skin around the eyes – all available now! Facial Radiance Intensive Peel helps resurface, smooth, and brighten skin by removing dead cells. It visibly smooths and improves the appearance of dullness after just a single use. 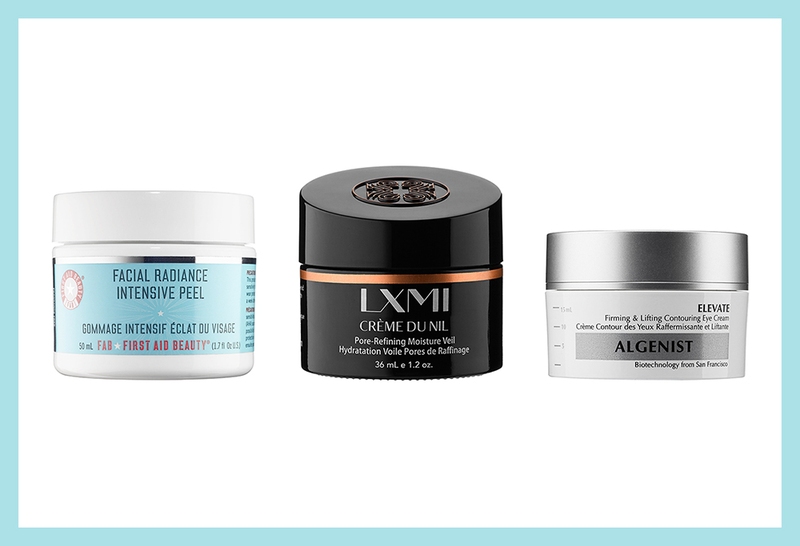 Three different types of exfoliators — lactic acid, salicylic acid, and actizyme — work together to provide effective exfoliating results and help support the skin’s natural renewal. The formula combines clay and active charcoal to achieve a pH balance that makes it safe yet strong enough to achieve dramatic results in a single step. Regular use of this exfoliating peel maximizes absorption of active ingredients from skin care products and helps maintain a perfect canvas for flawless makeup application or a no makeup day. Like the Nile River itself, Crème du Nil Pore-Refining Moisture Veil is a source of life for lackluster skin. A feather-light formula, it floods skin’s surface with LXMI’s signature ingredient, Nilotica Reserve™, which delivers up to 25 percent more essential fatty acids than traditional shea butter. With hibiscus flower acids to exfoliate skin’s surface and Ugandan vanilla pods to preserve natural beauty, this potent Nile River cocktail creates a dewy, youthful finish to prepare for flawless makeup application and to lock in nutrients while you sleep. This nourishing eye cream provides the ultimate sculpting and firming effect to visibly transform the delicate eye area. Alguronic acid — a patented compound produced from microalgae — and propeptide3 — a unique and powerful complex of functional proteins and active peptides — combine to help hydrate the area around the eyes, visibly lift the upper eyelid, and visibly strengthen skin density and elasticity. Gold works as a delivery system to increase the potency and efficacy for polypeptides. These extremely effective antiaging polypeptides act as collagen boosters to significantly reduce the appearance of wrinkles. Optical diffusers blur imperfections and brighten the eye area for a smooth and youthful look. These all sound fabulous especially the Algenist Eye Cream! Ótimos produtos, gostei de conhecê-los. The facial intensive peel sounds interesting, I'm tempted to try it out now! I'm in love with exfoliating, not live without! I loved to know the news. Have a blessed day, kisses!